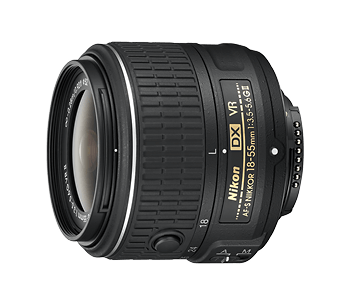 Lightweight and compact, the all-new retractable AF-S DX NIKKOR 18-55mm f/3.5-5.6G VR II lens is the perfect companion to your Nikon D3300. An improved optical performance, Vibration Reduction (VR) function and a minimum focus distance of 0.25 m/0.8 ft make this lens the sidekick you can’t do without. A revolutionary new retractable mechanism allows the lens to stay small while delivering images that are big in sharpness and clarity. While improving optical performance, the lens size and weight have been reduced by approximately 30% and 25% respectively. Vibration Reduction (VR) function effectively provides an equivalent to shooting with a shutter speed 4 stops faster, and the minimum focus distance of 0.25 m/0.8ft allows you to get incredibly close. Furthermore, the focus lip has been moved to the lip of the lens barrel, greatly improving manual focus operability. The circular polarizing filters have been upgraded with an attachment ring that does not rotate, making it easier than ever to control reflective lighting scenarios. 18 mm focal length: f/3.5 to 22 35 mm focal length: f/5.6 to 36 The minimum aperture displayed may vary depending on the size of the exposure increment selected with the camera.